Soft, delectable ricotta dumplings that look like artwork are among the standouts at Protégé. If you’ve been to the French Laundry, this ubiquitous starter is one of Thomas Keller’s best-known creations. 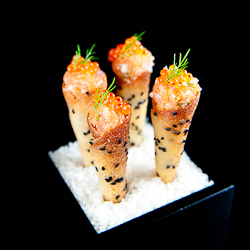 Tiny seed-flecked cones are filled with salmon tartare and minced onion with some caviar (naturally) crowning the top along with a microscopic sprig of dill. Called salmon cornets, they require a regiment of prep cooks, special holders and all the usual rigamarole of this temple of refined cuisine.